CONTINUED FROM PART 1: THE RISE. Terry Bowden in 1997. You are what you eat? With Auburn’s miraculous victory over No.1-ranked Florida in Gainesville in 1994, the Streak stood at a preposterous eighteen wins in a row. It seemed there was no stopping it—that it would never, ever end. And then, three games later, it ended—and in unexpected and improbable fashion. With two games remaining in the ’94 season, Auburn faced the Georgia Bulldogs in Jordan-Hare Stadium. Prior to the game, Dawg coach Ray Goff said, “You don’t just win all the time.” Sooner or later, he was implying, the odds catch up to everyone. Sure enough, the odds caught up to Auburn that night against Georgia. With the game tied at 23, the Tigers had one last opportunity to salvage the win. At every other moment over the past two seasons, when this sort of occasion arose, the Tigers always—always—closed the deal. Not this time. Matt Hawkins shanked the field goal. Terry Bowden and the rest of the Auburn Family looked on in disbelief. The game was over and Georgia had, as they said, “won a 23-23 tie.” Auburn still hadn’t lost, it was true—but this more than felt like a loss, and the win streak had ended at 20. The Iron Bowl in Birmingham a week later, against fourth-ranked and undefeated Alabama, felt like an anticlimax. Everyone knew the outside shot at a national title for “running the table twice” was now gone. At least three other teams were undefeated at that moment in time, including Nebraska and Penn State, and the one point in Auburn’s favor in an argument with any of them—nothing but wins over two full seasons—was now out the window. Alabama employed an option-based, grind-it-out attack that took advantage of Auburn’s relative defensive weaknesses by simply avoiding the Tigers secondary and attacking at the line of scrimmage. This approach also kept Auburn’s potent offense off the field for long stretches of the game. The Tide roared out to a 21-0 lead before halftime and the situation looked dire. Auburn fought back in the second half with two drives that culminated with short quarterback sneaks for touchdowns. Now trailing only 21-14 and getting the ball back one last time, deep in their own territory, the Tigers began what could be at least a game-tying drive. They moved the ball to near midfield and faced a fourth down situation, and they turned to what had worked so well for two seasons: throwing it to Frank Sanders. Sanders caught the pass in the middle of the field but was immediately knocked backwards and down. The initial contact appeared to have come across the first down line—it should have been a successful conversion. However, the referees marked the ball further back toward the original line of scrimmage, and the measurement showed the play to have come up inches short. Alabama was given the ball and ran the clock out. The season was over at 9-1-1, and Auburn had suffered its first loss in football since Pat Dye’s final Iron Bowl in that same stadium two years earlier. Terry Bowden’s record at that point was a sparkling, stunning 20-1-1. However, his record over the most recent two games was 0-1-1, and some fans and supporters who had always been a bit “iffy” on him were already sharpening their knives. The 1995 and 1996 seasons would do little to placate those individuals. Over those two seasons, and despite now actually being able to challenge for post-season play, Auburn settled into the more expected role of also-ran in the SEC. Picked to finish second in the country by Sports Illustrated and led by senior quarterback Patrick Nix and senior running back Stephen Davis, Auburn’s 1995 squad looked good on paper, and rang up big wins against outmanned early foes, but then fell in tough contests to LSU, Florida, and Arkansas. Wins over Georgia and Alabama at the end of the season offered some degree of solace, but then a 43-14 shellacking by Penn State in the Outback Bowl brought emotions crashing down again. An 8-4 record was disappointing after fans had experienced the Streak over the past two seasons—and Bowden’s post-Streak record now stood at a remarkably average 8-5-1. Things only got worse in 1996. New starting quarterback Dameyune Craig offered a jolt of electricity to the offense, and the replacement of seemingly disinterested defensive coordinator Wayne Hall with legendary Bill “Brother” Oliver promised a renewed emphasis on strong defense. Unfortunately, the running game dropped off a cliff with the departure of guys like Stephen Davis, Joe Frazier, and Fred Beasley. A one-dimensional offense and a so-so defense yielded exactly what one might expect: another 8-win season with losses to the big boys from Florida, LSU, Georgia and Alabama, and the narrowest of wins over Army (!!) in the dreaded Independence (or, as fans derided it, Weedeater) Bowl in Shreveport. Thus the pressure was on, and in a big way, when the 1997 season dawned for the Tigers. Terry Bowden had gone from 20-0 in his first twenty games to 16-9-1 in all contests since then, and Auburn had only managed a 9-7 mark in the conference over those past two seasons. Dameuyne Craig, however, was now a senior, and he had a nice squadron of receivers to throw to. If any sort of running game could be generated at all, the Tigers had a shot at big things in 1997. Everyone was watching. As it turned out, 1997 was not a bad year at all for the Auburn Tigers—good enough to provide Bowden a small measure of job security, at least for another year, but coming up just short of real glory. A come-from-behind win on the road against LSU proved that the team possessed real grit, and a big road win at Virginia to start the season looked great on television. Victories over Alabama and Georgia are always welcome, and the Tigers accomplished those two things in ’97; unfortunately, the win at home in the Iron Bowl was seen by many as being far closer than it should have been—another perceived negative for Bowden. That Tide team would end the year with only four wins, yet it took a near-miraculous Alabama fumble and last-second field goal for Auburn to pull out the 17-15 victory. Despite a competitive loss to Florida and an ugly shutout by Mississippi State—both in Jordan-Hare—the Tigers managed a 6-2 mark in the conference—a better record than they had achieved since 1994, and enough to get them into the SEC Championship Game for the first time. There they faced the Tennessee Volunteers and their senior quarterback, Peyton Manning. The Tigers and Vols had not met on the field since the year before the SEC split into two divisions, the annual AU-UT rivalry being one of the first victims of that new arrangement, as it placed Auburn in the West and Tennessee in the East. Auburn’s last win over the Vols had been a 38-6 blowout back in 1988, with UT winning two subsequent match-ups in Knoxville and the 1990 clash in Jordan-Hare ending in a tie. Tennessee, ranked third, was favored over an Auburn team that had not resided in the upper echelons of the AP poll since the loss to Florida back in October. Without a running game to speak of, it seemed unlikely that the Tigers could keep the game competitive. Somehow, they did. Auburn actually led for much of the game. Capitalizing on key Tennessee mistakes and turnovers, the Tigers led 13-7 after one quarter and 20-10 at the half, with key plays including a 51-yard strike from Dameyune Craig to Tyrone Goodson and a 24-yard fumble return by Tigers DB Brad Ware. Jaret Holmes was accurate in field goals from 30 and 48 yards, as well. In the second half, however, the Tigers missed out on numerous opportunities to put the game out of reach, and Manning rallied the Vols to the comeback win. Well into the fourth quarter, with Auburn clinging to a 29-23 lead, Manning connected with Marcus Nash for a 73-yard catch-and-run. The extra point put the Vols up for good, 30-29. Auburn was unable to mount a final scoring drive and the game ended with Tennessee running out the clock. Auburn had lost in the conference title game—but at least we’d finally made it there. The consolation prize was a return visit to the Georgia Dome a few weeks later, where Craig finished his dazzling Auburn career with a 27-17 win over Clemson in the Chick-fil-a Peach Bowl. The 1997 squad ended up with a record of 10-3, giving Terry Bowden his second and last double-digit-win season. It was his last because he would no longer be Auburn’s coach after six games of the 1998 season. 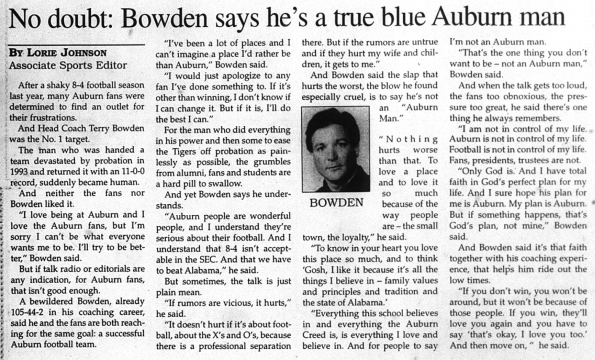 Story on Bowden in the Oct. 2, 1997 issue of The Auburn Plainsman. Click to enlarge. Trouble had been brewing almost from the time he was hired. Many Auburn fans and alumni hadn’t liked Bowden at the time of his hire and hadn’t much warmed to him after that, despite that gaudy, twenty-win streak to start his tenure. He did a remarkable job coaching the existing Auburn team in 1993-94, but his recruiting efforts were never able to match that performance. The Tigers lost out on many of the more desirable high school players and began to settle for individuals of questionable character, several of whom went on to get themselves in serious trouble because of their behavior. With his talkative nature and animated personality, Bowden was the antithesis of what Tigers fans had grown used to in their previous coach, Pat Dye: a slow-talkin’ good ole boy who espoused the virtues of the running game and a “hard-nosed defense.” In short, “Buster Brown” Bowden (as his future defensive coordinator, Bill “Brother” Oliver, had dubbed him years earlier) simply rubbed much of the Auburn Family the wrong way, and by this point some of the actions he’d taken during his tenure—things the fans could overlook in a big winner—began to irk them all the more. There was the changing of the block letters “AUBURN” and “TIGERS” in the end zone to a sort of baseball jersey scripting; there were the orange drop shadows behind the white numbers on the home jerseys; there were the black-and-white murals added to the stadium exterior that year, no fewer than three of which featured Bowden himself prominently. Even the moment when Georgia’s mascot, Uga, famously attacked receiver Robert Baker on the sidelines seemed somehow attributable to Bowden’s mismanagement. Knives were being sharpened, Bowden’s days on the Plains were numbered, and the disastrous start of the 1998 season provided the opportunity and the justification to jettison him. A horrific 19-0 shutout at the hands of Virginia in Jordan-Hare started the season off with a thud. The situation improved momentarily when the Tigers returned the favor to Ole Miss in Oxford the next week, winning 17-0. This would be Terry Bowden’s last win as Auburn coach, however—and ironically, coming against the man who would have his job a year later, Tommy Tuberville. Things then spiraled out of control. Four straight losses—to LSU and Tennessee at home, and then to Mississippi State and Florida on the road—left the Tigers sitting at 1-5, with Arkansas, Georgia, and Alabama still ahead on the schedule. To make matters worse, the offense in particular seemed not only inept but unconcerned at times, with new starting quarterback Ben Leard laughing on the sidelines after throwing yet another pick-six (something that happened with shocking regularity during this woeful stretch of games). The Tennessee game was actually winnable right down to the very last moment for Auburn; a startling fact, given that the very powerful ’98 Vols team would go on to finish the season undefeated and would be crowned national champs. The Tigers, however, could not get out of their own way against UT, throwing (yet another) interception that was returned for a score (this one a shovel pass, no less!) and then failing to complete a pass into the end zone at the end of the fourth quarter that could have sent the game into overtime. After a 24-3 drubbing by Florida at the Swamp, Bowden had a meeting with the higher-ups. Some later claimed he chose that occasion to quit. He claimed he was fired. The composite picture that emerged was that Bowden asked if he could save his job at the end of the season and, being told “no,” replied that he would just as soon end his tenure now. One way or another, Bowden was out and Brother Oliver was the interim head coach. The Tigers under his guidance would win that weekend against Louisiana Tech and (narrowly!) on November 7 against Daunte Culpepper’s Central Florida, but lose everything else and finish at 3-8—the worst record in modern Auburn history. At the end of the season, Oliver was cut loose as well (despite his vigorous protests). While supposedly prohibited by the agreement he signed with Auburn from discussing the program with the media, Bowden could never keep his mouth shut for long, and eventually rumor and innuendo emerged, allegedly from him, indicating that various money-related improprieties had been happening in the AU Athletic Department for years. Bowden, so the story went, had disliked the bad things he saw happening and had ordered them stopped for the future, but perhaps had not done as much as he could have in the present. These sorts of questions would linger on into the regime of the coach that followed him, Tommy Tuberville (particularly as they related to super-trustee Bobby Lowder), clouding his tenure with the Tigers as well. As of December 1998, the Terry Bowden era had officially ended, barely six years after it had begun with so many victories and such promise. Bowden’s final record as Auburn’s head coach was remarkably good: 47-17-1 in sixty-five games. When setting aside those first twenty wins during “the Streak,” however, Bowden’s final forty-five games resulted in a record of just 27-17-1. It wasn’t all bad, though. Despite the ugliness of his final season on the Plains, Terry Bowden’s tenure as head coach left Auburn fans plenty to look back on with fondness and excitement. An SEC Western Division title—Auburn’s first official one—and the Tigers’ first berth in the SEC Championship Game, as well as a 2-1 record in bowl games, are all positives. Two shocking wins over Florida, the entire career of Dameyune Craig, and that miraculous win against LSU in 1994—who could ever forget those? And the home field successfully defended three times in a row in the Iron Bowl—that’s an accomplishment any Auburn coach could be more than proud of. Above all else, there was the Streak—that epic, two-year ride—during which Bowden motivated the players, revamped the offense, and forged twenty straight wins even as the program suffered the sanctions of probation. The Terry Bowden era was not in retrospect a truly great one, but it was a very, very good one in a number of ways. We didn’t exactly climb to the mountaintop, and we did sort of end up stuck deep in the valley, but along the way, Bowden gave us all one heck of a ride. I came of age, if you will, during the Bowden era. The first game I remember attending was the 1993 Iron Bowl (my mom was at home with my new baby brother, so I got her ticket). And I will never forget the 1997 win over Alabama (which I was sure we would lose) or the loss to Tennessee in the SEC Championship Game that same year (which I was sure we would win). As a kid, I never understood the frustration surrounding Bowden. I had never really known Pat Dye, despite repeated viewings of the “Auburn’s Decade of the Eighties” VHS tape. So I never got the criticism — Bowden was the Auburn coach, and I was taught never to criticize the Tigers! So it’s interesting to look back on him in the post-Tuberville, post-Cam era and get some perspective. In short: Well done, as always! Van & John — I assume some version of this will be in your book? Luckily, Auburn history has been more about the guys wearing those “Blue Jerseys” and not as much about the monolithic Men on the sidelines (though we love Coach Dye, really like Tubs, and still call Shug “The MAN”). And the Bowden Era featured some truly great Auburn Men in those Blue Jerseys: Stan, Nix to Sanders (Frank’s still my favorite AU WR in my lifetime…Although Emory Blake is making a push), Takeo, Calvin Jackson, Stephen Davis (still love you bro – but please don’t help on any more hat tricks that don’t wind up at AU), Dayemuen (you to bro – I hope you come back to Auburn soon with FSU…so we can whoop that “A”), Fred Beasley, Tony Richardson, Ried McMillian, Brian Robinson, Chris Shelling, Jarrett Holmes (who was my favorite PK until that Byrom Guy started slaying Gators along with several other game winner…including one in the dessert) and the list goes on. 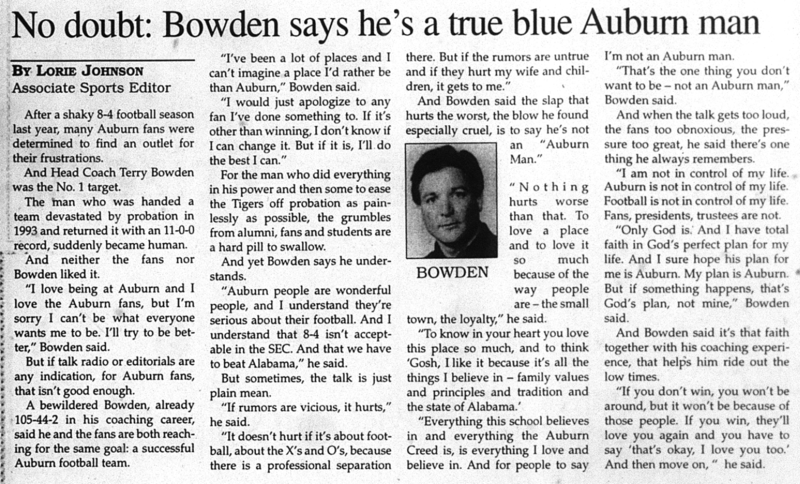 I grew up an Auburn fan, but was never fond of Bowden. He was allegedly hired for one reason, he was Bobby’s son, so he must know how to coach. Well he was only so-so at it. Could have been worse we could have hired Jeff Bowden. You also only glanced over a couple of points. You mentioned the base didn’t really care for Oliver, I don’t remember it that way but so be it. If anything we held it against Oliver for being a Bama grad. You also mentioned that it all unraveled for Bowden when he brought up issues of impropriety within the athletic department, remember that this was his word. Rumors out of Auburn about Bowden where very different. True or just rumor, I don’t know but they are still out there and still mentioned by Auburn people when his name is brought up. I do think you got one thing that was exactly right, his biggest failure was a simple one, he wasn’t Pat Dye. At the time Dye was still beloved, although somewhat disgraced at that point. Bowden was not a bigger than life figure like Dye was, he was an outsider. Here’s the problem with Bowden. He really was a good coach and would be a great offensive coordinator at any school. His problem was that he was not a great manager. He was not his dad. If you will recall, during the 90’s, Bobby Bowden owned the state of Florida in recruiting. Yes, I know there were good players at UF, but FSU had the elite talent because FSU had that swagger that everyone wanted to play for. Spurrier won at UF because he was that good of a coach. Terry could not get those same kind of players by name alone because there was another school in the state (which I will not mention) that was recruiting equally, if not better than Auburn. Bowden ran the spread before the spread was really popular, but he did not recruit the players to make it work. He was recruiting players that he would have gotten at Samford. I mean come on, Markeith Cooper as a HB. I love him and all, but that wouldn’t cut it. Anyways, there were rumors that he didn’t know half the players names. It ended up being a mess. However, as it has already been pointed out, he gave us many great memories. He just did it with Pat Dye’s players. I can remember Terry showing up on karaoke night at Denaro’s, getting on stage and singing James Taylor songs. Coach Dye wouldn’t have been caught dead doing that I can promise you. Bowden was primarily concerned with promoting himself and not Auburn. That was one of his biggest problems. And can you imagine Coach Dye or Coach Jordan walking out on his players in the middle of a season? Not very damn likely. Terry came, he saw, he conquered. He shrunk and left his team in the lurch. I cannot find it in me to give a pass to any coach for walking out on their team. Didn’t the ‘Tiger Eyes’ logo come on board during his tenure? Never did like that one. Did we copy the tiger eye from LSU? I remember Bowden was pictured over 60 times (I counted) in the Auburn Football Illustrated game programs toward the end of his tenure. There were also many off-the-field rumors about his conduct (man behaving badly). Seems to me he tried to run his dad’s offense, but without the talent that FSU had. I wish I had access to the library’s copies of The Plainsman. The summer of 1999 or 2000 (I can’t remember exactly but I was the features editor for the summer) was when Bowden decided to start talking about “the little black book” and Wayne Hall and other whisperings with one of our sports reporters. Bowden had finally sold his multi-million dollar house in town and was moving on — was this his parting shot? Paul Finebaum’s show (sponsored by Colonial Bank at the time and had Brother Oliver and Coach Dye as regular guests) asked to have The Plainsman’s managing editor on his show and attacked him and the story. We were all in shock. Was The Plainsman a pawn? Was Bowden telling the truth? 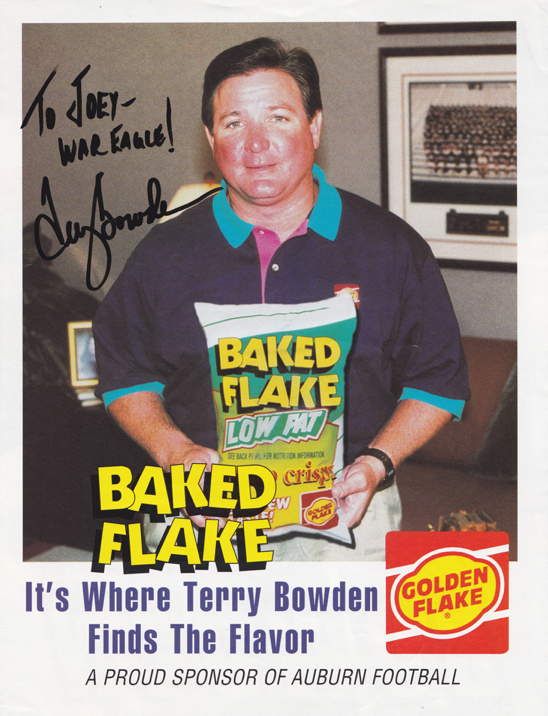 It was so weird and complicated (and I was relieved to be writing about bars and Jane Randoms) but I got a sense of the VERY RAW nerves and backroom battles still associated with Terry Bowden’s time at Auburn. The thing I remember as his tenure wore on was the lack of on field discipline. Lots of illegal motion calls, lots of personal fouls, lack of ability to run the ball (I am too lazy to look it up, but I seem to remember having negative rushing yards in all 3 losses in 1997). The funny thing is, all those things turned up again when he was coaching at UNA the last few years. UNA would get tons of penalties, and against teams with nearly equal talent, they had real trouble running the ball.